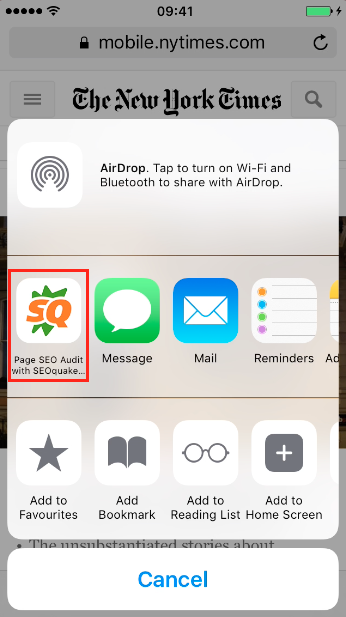 We’re excited to share amazing news: you can now use SEOquake from your iPhone or iPad. You can find our new app in the App Store by searching for "seoquake go" – that's what it's called. Currently, the mobile version of SEOquake contains only one report – the Page SEO Audit report, which will help you find and fix all major technical on-page issues affecting your SEO. However, we’re ready to add more features and reports based on your feedback and suggestions. You can easily send a site’s page from browser to the SEOquake app using the ‘Share’ function on your iphone. Mobility increases your chances of success. Performing an SEO audit has never been so quick! Creating this app was a new experience for us, and we're really looking forward to receiving your feedback. Tell us, what features would you like us to add? Feel free to send us your comments and suggestions at [email protected]. Thanks for helping us develop our new app.